Just about every Mardi Gras partygoer wants a set of beads, as the plastic necklaces serve as good luck charms and have become synonymous with the festival. Green, gold and purple signify faith, power and justice, but around Mardi Gras time, any color will suffice. To help celebrate the festivities, engage party guests in bead games that capture the spirit of "Fat Tuesday." 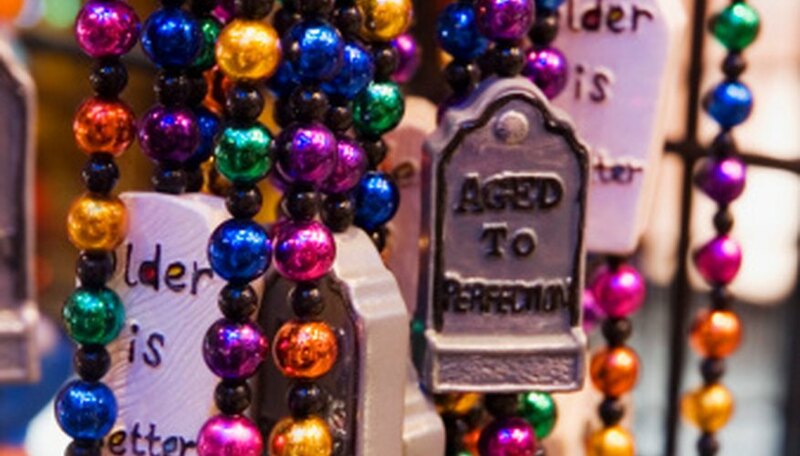 Have a bead scavenger hunt to celebrate Mardi Gras. Prior to the game, make sure you have a variety of beads, such as different-color beads, coin beads, jester beads, light-up beads and oversized beads. Make a list of questions that ask who's wearing a specific set of beads. One question may be, "Who has three strands of purple beads?" Have guests remove any beads that they wore to the party and distribute your beads. Make a note of the guests and the beads they're wearing. Give each guest a pen and a copy of the list of questions. If all guests do not know each other, have guests wear name tags. Either have guests hunt until one completes the list with all correct answers, or set a time limit of five to 10 minutes to see who gets the most correct answers. If more than one guest completes the hunt simultaneously and with all correct answers, put their names in a hat and select the winner. The winner becomes Mardi Gras King or Queen and tosses out beads to guests. As a variation, have guests collect beads or gold coins in a treasure hunt. Prior to the hunt, hide bead strings, gold coins and gold crown necklaces in the party area and, if weather permits, outside surrounding the house. Give each guest a gift bag and send them off to hunt for treasures. The guest collecting the most bead strings or gold coins wins. Bead tossing ranks as a standard Mardi Gras activity. Have guests hold buckets or upturned hats as one guest overlooks the crowd and stands on a raised platform. Have guests take turns tossing bead strings into the crowd, aiming for the buckets or hats. Keep a running tally of how many strings guests land in the buckets or hats. The guest landing the most beads in the targets wins the game. Engage guests in a competition to see who ends up with the most beads before the party concludes. Give each guest six bead necklaces. As you converse with guests, take one bead necklace away from any guest who says the word "bead," or any Mardi Gras-related term. To go along with your key-word challenge, shout random trivia questions throughout the party. Toss a bead necklace to the first guest to shout back the correct answer. At the end of the night, tally guests' number of bead necklaces and award a small prize to the one who has the most. Engage party guests in a Mardi Gras version of "Musical Chairs," in which they wear bead necklaces around their necks. Upon starting the music, have guests dance. Once the music stops, guests must freeze in place like a statue. Guests caught moving after the music stops remove themselves from the game. Start the music again and continue in this start-stop manner until one player remains. As a variation, loop beads around guests' outstretched arms. In either version, you may exercise some leniency, as the beads may make noise for a time even after players freeze.